It was April 16, 2003. The Philadelphia 76ers were hosting the Michael Jordan and the Washington Wizards. All eyes were on MJ that night, as it would truly be the last time anyone would see him playing in the NBA. He played 28 minutes and scored 15 points, while adding in four assists and four rebounds. After leaving the game in the third quarter down by 21, the crowd began chanting, “We want Mike,” which led to His Airness hopping off the bench and back into the game with 2:35 left in the fourth quarter. Appeasing the crowd, Jordan played for roughly one more minute. He was intentionally fouled in the backcourt by Eric Snow, sending him to the line for a pair of free throws. Those would ultimately be the final shots Jordan would take as an NBA player. A quick timeout by Philly, and Jordan exited to the bench and off the hardwood for the final time. The Wizards went on to lose that game, 107-87. We may have known this was Jordan’s last game, but what we didn’t know was what would happen to the future of the Air Jordan. Would Jordan Brand stop here, or continue as it had done so the previous times Jordan retired? We all know the answer now, but in 2003 there were months of speculation all over the NikeTalk and ISS Forums as to what would actually happen. Air Jordan Retros were in full effect by this time, but people still wanted to know if they would ever see a new flagship model Air Jordan again or if the 18 would be the final silhouette. Designed by Jordan Brand senior footwear designer Tate Kubris, the Air Jordan 18 was inspired by auto racing with carbon fiber in the midsole as well as a rubber heel wrap. Fine Italian dress shoes also played a part in the look, with the stitching wrapping around the midsole. All seven original releases (highs, lows, and .5s) even came with a matching towel. 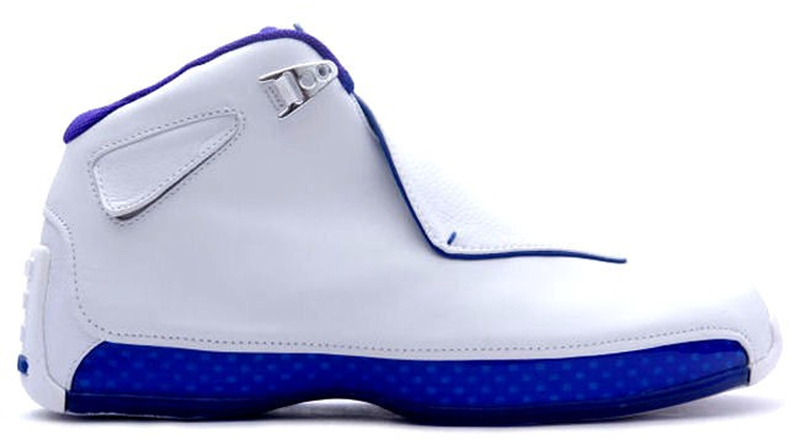 While the 18 tends to be under appreciated, the 2018 retro of the “White/Sport Royal” that Jordan wore for his final game is currently selling for an average of $285 on the resale market—$60 more than its already steep $225 retail price. On the other hand, the color suede pack that dropped later in the yeah was quick to hit sales racks, and can be picked up for far below retail today. Unlike the suede pack though, the White/ Sport Royal 18s had true significance. Sure, the 18 was worn when Jordan was well past his prime, but it gave us his last memorable on-court moment, nonetheless. Whether you had a pair when they first dropped, copped them after on the resale market, or grabbed a retro, or fall into the group who appreciates true significance rather than hype, don’t forget about its meaning. They not only said goodbye to a legend on-court, they also ushered in a new era for Jordan Brand.